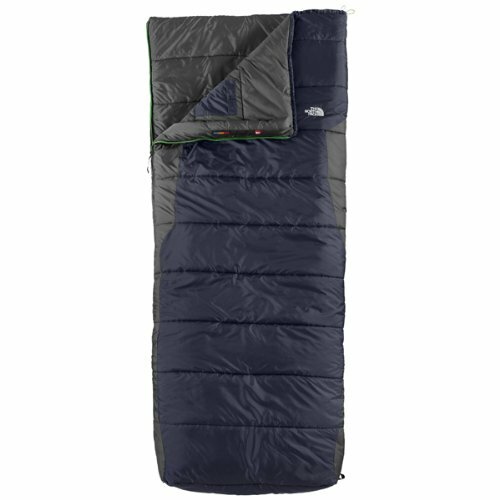 Sleeping Bags That Zip Together: A Versatile Solution! It's handy to have sleeping bags that zip together. They are the basis for a versatile camping sleep system! Having bags that can be attached allows you to meet the changing needs of your family without constantly buying new sleeping bags. Most sleeping bags can be zipped together. As long as they have zippers that match, most sleeping bags will zip together. Check the sleeping bag zippers before trying to attach your bags. Are they the same type, size and length? Great! You have sleeping bags that zip together! These are the simplest to zip together. If you are looking for bags that will easily zip together, consider buying two of these. This bag opens flat and can also be used as a blanket. Looking for something a bit warmer? This bag is rated for use above 30 degrees F.
Two of these would zip together easily. It's perfect for car camping (but too bulky for backpacking.) Unzip it and you have a cozy comforter! Need even more warmth? Here's the bag for you! It's rated for temperatures above 20 degrees F.
This bag has a handy pocket for storing your keys, and comes with a stuff sack. These can be zipped together too, if their zippers work together, and if the bags are the same size. The tapered ends don't interfere with the doubling. Click here to learn about barrel sleeping bags. 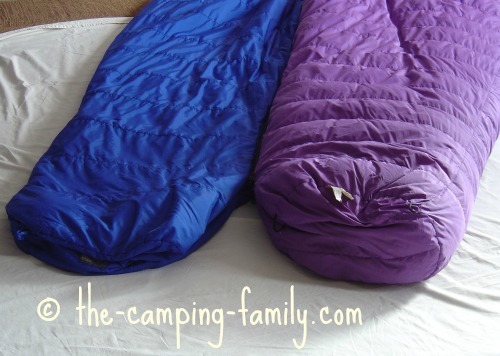 Click here to learn more about mummy sleeping bags. This arrangement won't be particularly comfortable. The foot boxes will be separate, making cuddling decidedly awkward. I know - because I tried it - that you can even zip together a mummy bag with a barrel bag. I don't know why you'd want to, though! It makes for a very uncomfortable arrangement. 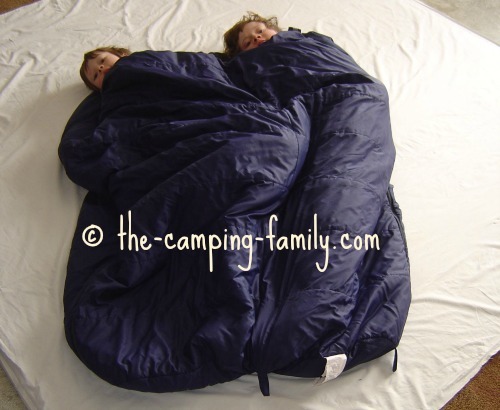 Some families buy a double sleeping bag - but a double sleeping bag won't work when you need just a single bag. With sleeping bags that zip together, you have two single bags when you need them, and a double bag when you want it. Try zipping together a warm bag and a cooler weather bag. On a warm evening, put the cooler bag on top. Voilà! A multi-purpose sleep system! On a cold night, separate the bags and let each person cuddle inside his or her own bag. They'll be warmer than if they were in a double bag. If you are accustomed to the family bed, having two sleeping bags that zip together allows parents and a child to sleep together. This works especially well when you have a toddler. It's cozy (or should I say it's cramped), but it can work. 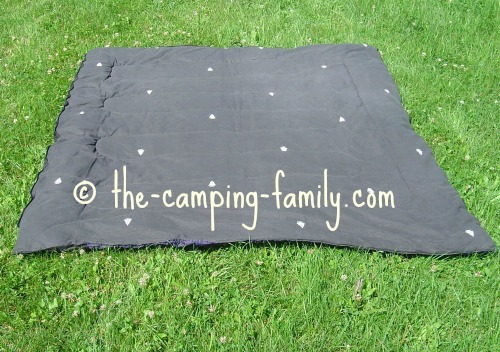 Click here for more ideas about sleeping in a tent with toddlers. Even if your little ones have their own sleeping bags, they may sometimes need the comfort of sleeping with their parents - when they are sick, for example, or frightened or overexcited. 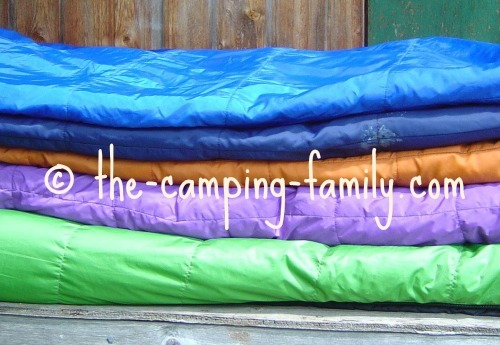 Having the option to make a big family sleeping bag might be just what you need. When they kids get bigger, you and your partner can decide whether to zip your bags together, or each use a single bag. It can be challenging to get the bags zipped together! If you know that you are going to do this regularly, you might want to consider getting a double sleeping bag instead. The hardest part of zipping two bags together is getting started. Here is a photo of two bags, ready to be zipped together. 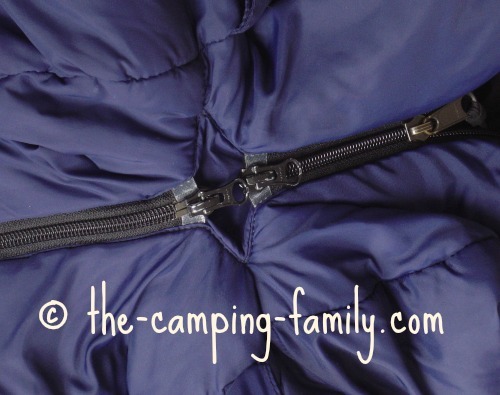 Before you begin, take a good look at each sleeping bag zipper, and see how they line up. Once you've figured out that part, the rest is easy! Don't wait until bedtime to zip the bags together! Set up the tent and make your beds early in the day, when you have lots of patience and energy. Don't wait until dark to zip the bags together. In cold weather, don't zip sleeping bags together. If you are camping when it's cold, keep each person in one single bag. Zipping two bags together (or using a double sleeping bag) leaves a large opening at the top of the bag. Cold air will rush in through the opening. One person in a single bag will stay much warmer than two people in a double bag. You can try stuffing clothing in the opening, but you'll be cold anyway. Click here to read more about cold weather sleeping bags and click here to learn how to stay warm in a sleeping bag. 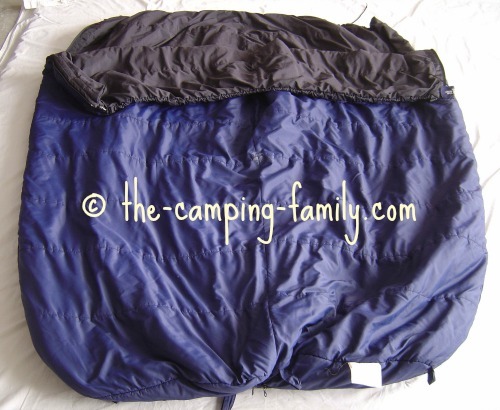 When our children were small, we bought a sleeping bag extender. It's a piece of fabric with a zipper on each side. 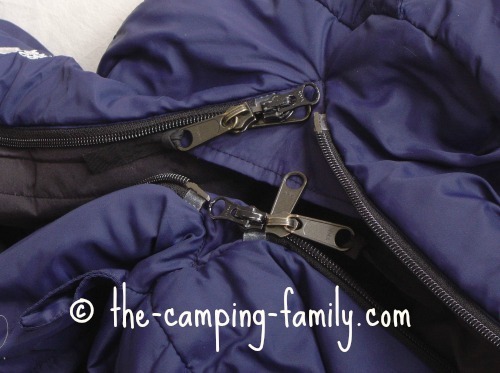 Each of the zippers attaches to a sleeping bag, and the two sleeping bags zip together. When it's all put together, you have a huge envelope - big enough for two adults and one child - or even two adults and two very small children. Unfortunately, sleeping bag extenders seem to have disappeared from the market. If you ever see one of these at a garage sale or a thrift store, scoop it up! It's a really handy thing to have. Your camping sleeping system will change as your family grows and changes. 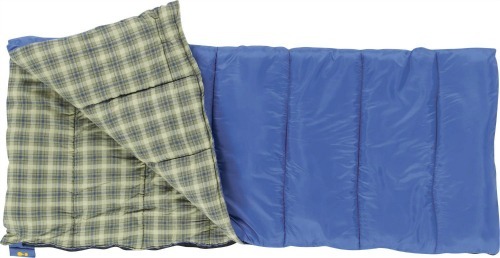 Sleeping bags that zip together help you to adapt to those changing needs. 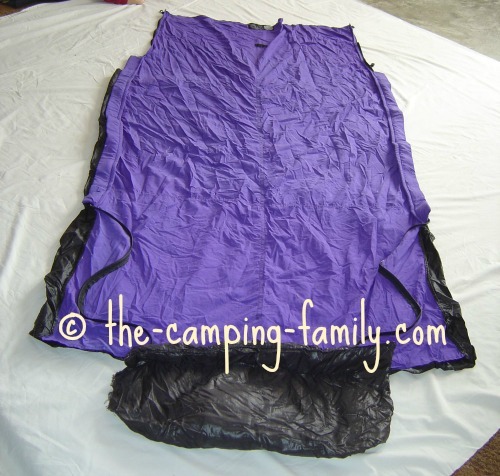 Now that you know all about sleeping bags that zip together, click here to learn more about camping sleeping bags. 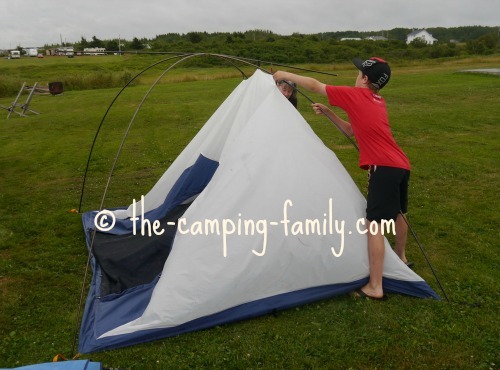 Visit The Camping Family home page for lots of great camping ideas.